At Williams Ob/Gyn & Associates. our priority is to deliver quality obstectrical/gynecological care to informed patients in a comfortable and convenient setting. We perform Minimally Invasive Surgery (MIS) and offer treatments for Menopause, Infertility, Hormone Imbalance, and many more. InvoCell is a low cost form of IVF. In our office the fee is approximately $3,900.00 for retrieval/InvoCell/ and transfer. The medication is extra and certain pharmacies offer a reduced price on stimulating medications. Depending on your age and fertility potential; medication can run from as low as $1,500.00. And if you have a lot of follicles (eggs) you may want more than sedation for the retrieval. Instead you may request to have an anesthesiologist present which will be $400.00. If you have many left over embryos after the transfer, then freezing is approximately $1,100.00. When you have needs for obstectrical/gynecological care, you need to turn to a doctor who listens and responds. An experienced doctor who knows the field and can effectively diagnose and treat your needs. a friendly physician who counsels you on the best ways to maintain and improve your health. Our physicians meet all these criteria. Plus. you benefit from a dedicated team of trained professionals who give you the individualized attention you deserve. 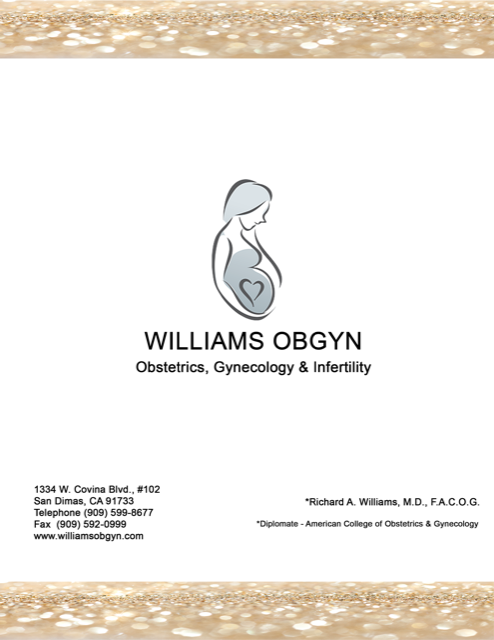 Williams Ob/Gyn & Associates believes that informed patients are better prepared to make decisions regarding their health and well being. That is why we've included information on this web site covering topics associated with obstectrical/gynecological care. The best care in the world doesn't mean anything if you can't access it. At Williams Ob/Gyn & Associates. we strive to make our San Dimas office as efficient and convenient as possible. 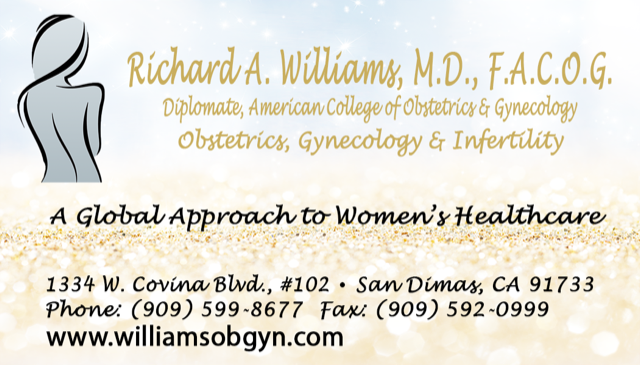 Included in these web pages is information about Williams Ob/Gyn & Associates including maps, directions to our San Dimas office, hours, insurance policies and appointment scheduling. You can even email a request for an appointment by clicking here! We hope you find this website useful and invite you to contact us with your questions at any time. We are in transition with all our healthcare changes and our staff trying to implement them. If there are any problems or concerns please do not hesitate to call me or email me, I will be happy to resolve the issue immediately.